Season the chicken with salt and pepper. Heat the pan and oil, wait till the oil is almost smoking. Skin side down, add the chicken. Preheat the oven on 160C. Brown one side and flip over to brown the other side. Turn the heat off and add pineapple pieces along with ginger, garlic and chilies. Combine the orange juice and soy sauce. Add all three liquid to the pan. Braising should also be low in heat and long in time. My braising time was around an hour. Depending on your setting your time might vary but it should not be less than an hour. اگه مایلید با برنج این غذا رو صرف کنید ، یک پیمانه برنج رو با یک و نیم پیمانه آب دو قاشق غذاخوری کره و یک تا دو قاشق غذا خوری کنجد سیاه درون پلوپز بپزید. To cook the sesame rice, combine 1 cup of rice, 1-1/2 cup of water, 2TBSP of butter, 1 to 2 TBSP of black sesame seeds and salt. The juice should reduce to half. what you see below, is half way through! 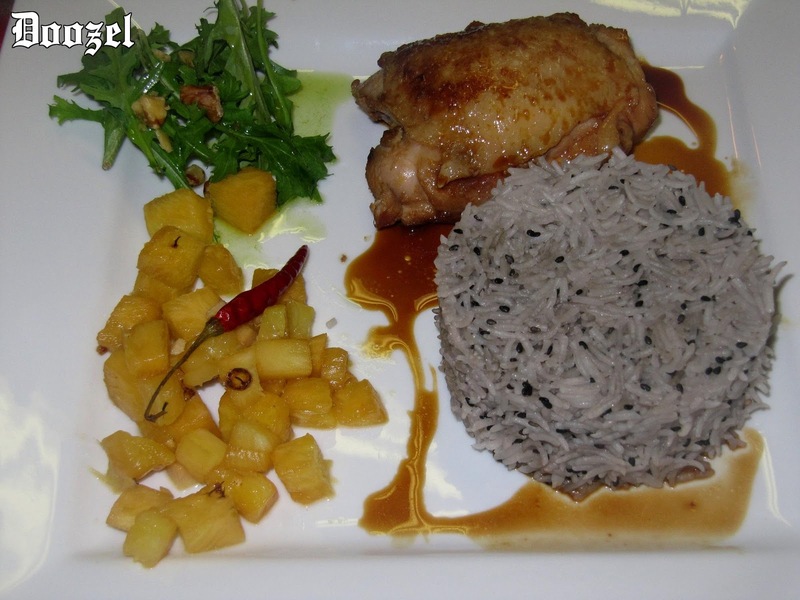 Dice the braised pineapple and serve along with rice and chicken. Concentrate the braising liquid from the pan and make a ju. This is slightly salty but so delicious. Finish off with the ju. The chicken is so tender and juicy as you see! طرح و نقشه نوتر از نو مبارک! ماو گیاهان رو هم دریابید لطفا! I really follow your blog and I enjoy it very much, thanks for the great work (of course as professor and as a chef:). I also enjoy the presentation of the dishes you post and I have one question. How do you mold your rice in cylinder shape in the plates, I would appreciate if you teach me that. This operation is really easy and the resulting rice is beautiful. Thanks so much, for sure I will try it.